Get 30+ facials per jar! 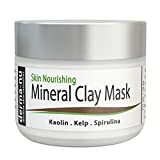 Berry Moon Anti-aging Charcoal Clay Mask for oily skin, congested T-zone, blackheads, enlarged pores, dark spots. With Vitamin C and Green Tea. Large 5oz jar. 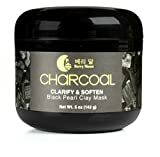 Korean Beauty inspired charcoal mask with cleansing Charcoal Clay Mask will clarify, soften, and detox the skin for a flawless look. Gentle formula is infused with Rosewater and Witch hazel to help tone combination and oily skin types, without over drying like other clay and mud mask. 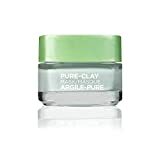 Targets oily skin, a congested t-zone, fine lines accentuated by dry skin, dull skin, and dark spots. This moisturizing blend improves the look of fine lines and wrinkles caused by facial expressions. Soothing Charcoal Mask features Licorice and Green Tea to improve the look of redness. Perfect for those who have normal, combination, or oily skin. Detoxifying mask draws out skin impurities and restores a youthful look. 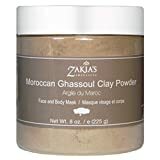 This charcoal mask for men or women supports a renewed and moisturized complexion. Anti-aging face mask with Vitamin C and Sea Silt to help brighten skin and minimize the look of dark spots, age spots, and scars. For best results, use this mask 1-2 times per week and apply your favorite face serum or moisturizer after. Try Risk Free: We’re so confident in the effectiveness of this charcoal face mask that we’re offering it with a 100% money back guarantee! Manufactured in the USA, Vegan, cruelty free, Paraben-Free, Formaldehyde-Free, TEA-free, No Drying Alcohols, No Mineral Oil.